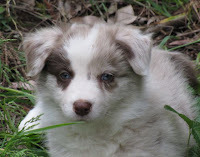 I am SSOOO excited, tomorrow Brody and I go and pick up the new addition to our family. The litter was born late September, and they are full Border collie - their mum Chip is a chocolate merle, and their dad Bear a chocolate and white. friendly and inquisitive, and very brave... plus she is playing and tugging really well already! I will post later with more about Brody's little sister!